Will Smith is a cool MF, not doubt, and every film in which he stars, especially if he is more or less the only character, is worth seeing and usually fun to watch. Same with “I am Legend”. However. 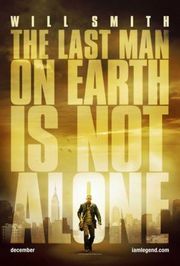 If you look at the more spirited performances in “Independence Day” or “Men in Black”, and compare it with “I, Robot” or “I am Legend”, the alarm bells start ringing. His films are getting less entertaining one by one, and now, with the filming of the Richard Matheson story, we are at a point where watching the film is a very distanced experience, an observational one rather than an immersive one. It just does not drag you in. Or it does, actually, in the first half hour, when the dull and depressive life of the Will Smith character, being left behind by all these billions of people being annihilated or mutated into raging beasts, is rolled out. His routines, his simulations of real life, his breakdowns. It is when the action kicks in that the film starts limping, and it is getting worse every minute. The personification of a “lead rabie” who seems to have something like a personal dislike for Smith, is the one thing getting on my nerve. The other is the woman with her kid, who may be called the most superfluous movie characters in living history (maybe with the exception of the mutant Roger Rabbit that was involved in Star Wars – Phantom Menace… you know whom I mean… whatshisnameagain… JaJa). There are some nice cgi goodies, such as a bunch of dog mutations or a herd of deer, and the hunting scene at the opening is actually a very nice bit of cinematography. The “drama”, however, is only backstory, and the new plot is so simple and straightforward that you have seen it in just about every Vampire-Zombie-Rabie-film of the last 20 years. A Shame, really, as the setting would have allowed so many possibilites.